Vineyards and orchards line both sides of the valley, straight ridges of vines and trees climbing up the hillsides. At the bottom, crystal clear waters of Lake Okanagan and Skaha Lake lay in placid serenity, their mirrored surface a reflection of the blue skies above. Sighing, I slip over the edge of busy into calm. I am content. Yesterday, C.C. and I visited four more possibilities for our wedding. There is no ‘have-to’ with our date. It’s one we set. Just because. All the venues we’ve seen have beautiful possibilities, but… well some are just more beautiful than others. We’ve set a grading scale — 1 – 5. And of course… the wine. We haven’t gone through all our notes yet but, it feels like no matter what location we choose, it will be magical and marvelous. But, do we risk April or move to a date later in May? When the vines have had a chance to ripen. When the weather has had a time to free itself from winter blues. Regardless of what site we choose, we have had a magical time in the valley. 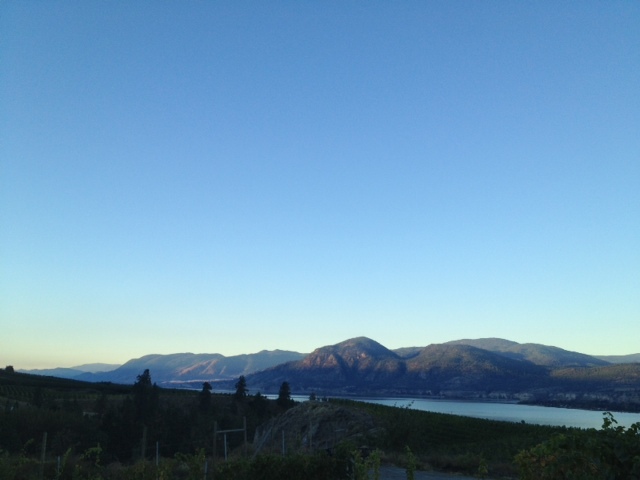 Our last stop yesterday was at La Stella, an old world vineyard that is perched at the edge of Skaha Lake just at the tip of Osoyoos, a small arts and crafts town at the southern edge of Okanagan Valley. Mike Kosaka, the vineyard operations manager, walked us down to the wedding site, chatting all the way about the beauty of the location (it is undeniable) and the challenging logistics of holding a wedding as ‘small’ as ours on their site. Logistically and economically, weddings of 150 – 200 make sense here. We’re planning for sixty. It didn’t matter. The site was gorgeous and while we probably won’t be getting married there, Mike spent a delightful hour with us talking about the area, wine-making and his journey to vineyard manager. As we sat on the deck of the Tasting Room, exploring La Stella wines, he talked about pruning the vines and other facts and tricks of viticulture and his wife’s deep roots in wine-making in her homeland, the seat of Burgundies and Beaujolais and all things winey. He shared stories of wine-makers through the ages and the art of barrel-making and barrel-keeping. He talked of cycles of growth and self-planting vines and wine-snobbery and wine-mystery. And through it all, we were enchanted. His passion. His knowledge and his generosity created a tiny bubble of joy that kept spreading out to encompass us both as we listened and asked questions and shared some of our favourite winery stories too. C.C. has caught the bug. The dream of owning his own vineyard, something he’d set aside many years ago, has reconnected to his psyche. I swear he’s already plotting out the where’s and how’s! The who’s and what’s! As we drove back along the lake, the late afternoon sun glistening on its waters, the shadows deepening in the crags and canyons of this arid land, we felt replete, complete and connected. Not just to the lore of the valley but to the story of life lived on the edges of the water’s of possibility. And on our way back, we stopped at Hillside Winery, one of the possible venues for our wedding. We enjoyed a delightful dinner beside the fire as outside the sun slipped below the mountain peaks and the air quickly lost the heat of day. Tiny fairy lights came on all around the patio outside and we were embraced in the wonder and awe of the valley and being together here, in this place, where dreams awaken. I am go grateful to accompany you on this happy process, Louise! Wow! Lovely pictures! All the sites seem to be so alluring! The description too is amazing! Thanks for sharing.